Spotted this on my walk to work this morning. 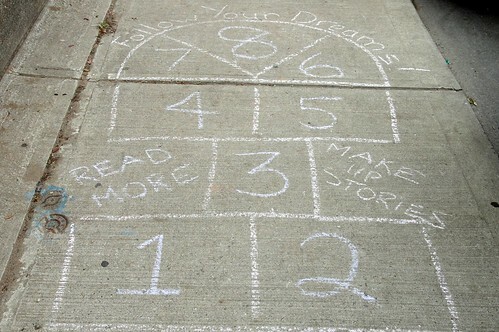 This is a seriously smart game of hopscotch. It’s been so long that I had to read up on the rules of the game. In France we call that game “La marelle” but there are some differences in the rules… though you still have to jump!!! Did you play? Did you play? Oh how wonderful. Our three-year-old has recently discovered hopscotch, and so we’ve been drawing courts everywhere with his sidewalk chalk. I do believe I will have to introduce him to this version soon.